2007-2014 Chevy Tahoe + Suburban 1500 Ready Lift 1.5" FRONT Leveling / Lift Kit5Max H.August 9, 2010I bought this lift kit because I wasn't really happy with the stance of my truck. This made all the difference in the world. This kit raise was easy to install but takes some time. The instructions were very understandable as well as very accurate. I recommend this product to anyone looking to alter the stance of their truck. The part number for this Ready Lift front lift kit is 66-3090 and it fits 2007-2012 Chevy Tahoe and Suburban (all 1/2 ton 6 lug) models. 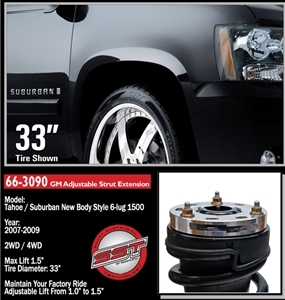 It lifts the front of your truck 1.5", giving your truck a level stance and allowing you to safely run up to 32" wheels.